I have a 2018 wrx premium Would I need anything else to install it ? A: You'll want an OEM downpipe to 3" catback adapter for proper fitment. would this fit a 2012 wrx? Will this fit a 2019 wrx with stock downpipe? What adapters do I need? Will this fit a 2019 STI and what hardware will I need? What is the sound level for this? A: Unfortunately, neither us nor Invidia has the Sound dB level available for this Cat-back exhaust at this time. A: Sadly, we do not have confirmed fitment for the 2019 model years as of yet. 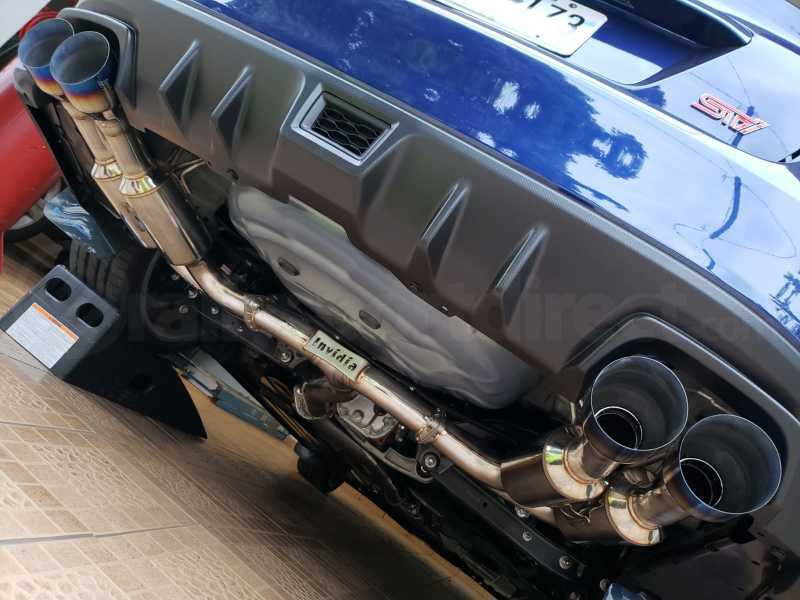 Will an invidia r400 exhaust fit a stock downpipe? A: You will need an oem downpipe to 3" adapter and a new donut gasket. Do I need an adapter for this? Also what are the gasket sizes? I just recently installed this and one of the gaskets are no good. A: For the adapter, you'll want part number: GRM 077046. The gaskets would be GRM 022001 and GRM 020031 depending on which one is bad. I have recently installed a invidia r400 cbe to my 2011 wrx. The exhaust is meant for wrx’s from 11-18. I have read that I’ll need an adapter? So I bought an invidia stock down pipe to 3” cbe but it doesn’t seem like it fits ? But the stock down pipe slides into the cbe and seems like I don’t need an adapter. I have the R400 for my 2014 WRX I'm trying to sell to a friend of mine, but they have the 2016 WRX. I looked at the pictures for both years for the catback and couldn't find any differences. Could you tell me if it'll work, or not at all? A: We are not able to confirm fitment but the chances of it fitting are slim to none. I have a 2018 WRX base model, do I need to buy anything else to make cat-back system fit? A: Info given was incorrect, you dont need the 3inch adaptor to fit the oem down pipe to the catback system. You also dont use the oem doughnut gasket, a flat gasket is provided in place of the doughnut gasket. Shipment came in last week and did the install a few days after. After inspection of the stock system, and comparing it to the new system, it is all direct fit bolt on. This review applies to the 2018 wrx base model. Not the STI model. I currently traded in my 17 WRX for a 2018 STI. My question is I had the Gemini R400 on my 17 WRX, will that fit to the 2018 STI? Or do I need A adapter? And if I do is it possible to post the link to the adapter thanks. How does the sound of this exhaust compare to the 2017 Subaru STi stock exhaust? I saw some comments about folks stating that this exhaust is "quiet". I know there are videos out there, but it's hard to gauge based on the ones I've seen. A: The R400 is meant to be Invida's mid-level sounding exhaust. I have 2018 wrx premium and its been brought to my attention that if i purchase this exhaust i will need some special adapters? Where can I purchase a OEM to 3inch adapter and how much is that part? So i have this exchaust for my 2015 wrx limited.. im planning to trade my car to 2017 or 2018 sti sport.. is it gonna fit on the sti?? I have this exchaust on my 2015 wrx and im planning to trade in to 2017 or 18 sti.. is it gonna fit ?? I have the R400 mufflers with the Y pipe. I was wondering if you guys sell just the piece that goes before the Y pipe. A: Unfortunately, we do not sell any sections of the exhaust separately. A: Yes, this will fit 2015-2018 WRX Models and we will be updating our confirmed fitment to show this. Thanks! I recently bought a 2018 Wrx limited and want to upgrade exhaust to the Gemini R400 with titanium tips to improve looks and definitely sound. My question is do I need to buy anything else besides the kit if I am keeping the stock down pipe? Also will I have to tune the car. Right now it is 100% stock, and I don't own a tuner. Thanks in advance. A: You will not need to tune for just the catback. You will need a stock downpipe to 3 inch catback adapter however as well as a new donut gasket. Does this exhaust drone at cruising speeds (i.e.. on the freeway, running around 75mph)? How does it compare to the Greedy Supreme SP for a VA STI? A: Sound is something that is EXTREMELY hard to imagine when talking over text. Everyone has a different idea of what drone sounds like but for the most part not this should not have any drone. For comparisons I recommend going to YouTube and comparing other customers sound clips. Hi i have bought this exhaust and a grimmspeed oem to 3 in adapter will i also need a subaru oem donut gasket? or any other accessories? A: You'll need a donut gasket but other than that you have everything. Which Adaptor would you recommend we purchase to mate the downpipe to the exhaust? A: Depending on the downpipe you could do Invidia, Grimmspeed or Mishimoto. All those brands would be great. Was there any changes from the 2017 to 2018 model in terms of exhaust that may affect fitment? I just bought a 2018 wrx and would be interested in purchasing this exhaust. Thank you! A: This is for 2015+. This will work for your car 2018 wrx. I'm already running Q300 and dowpipe, with protune. If i change mine to this (catback only), does it require a retune? A: Retuning will not be required when changing just the catback.